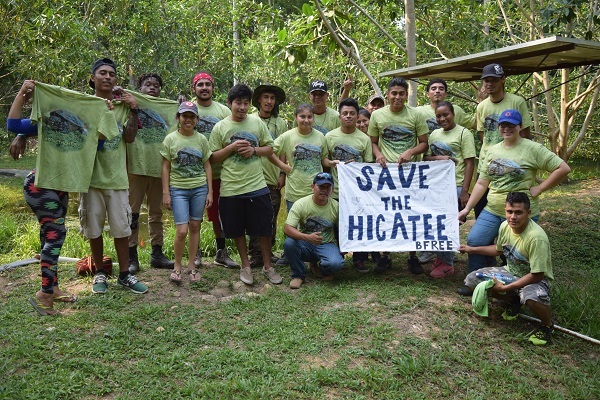 What is the Hicatee Conservation and Research Center? The Hicatee Conservation and Research Center (HCRC) is the only ex-situ facility in Belize maintaining Dermatemys mawii (Hicatee turtle) in captivity for the purpose of studying aspects of its biology and behavior. The HCRC is a joint project of the Turtle Survival Alliance and BFREE. The HCRC includes two ponds which are approximately 100’ long and 80’ wide and 9-12’ deep in the center. A well and solar powered pumping system supplies fresh water to the ponds. The areas around the ponds are planted with Paspalum paniculatum, a weed like grass that is the primary diet of the Hicatee, as well as dozens of fig and bri-bri trees – also preferred food plants for the Hicatee. Because of the facilities’ unique location in the middle of the rainforest where wildlife predators roam, a 10′ chain-link fence was constructed for the protection of breeding population and turtles born into the project and therefore surrounds the perimeter of the two ponds. A 10’ x 10’ floating island covered in vegetation was constructed for each pond. The floating islands provide cover, help clean and oxygenate the water, and create a thermal gradient to provide a variety of temperatures for the turtles to choose from. Hatchling turtles are housed in a custom enclosures. Both the adult ponds and the hatchling tanks use a flow through design with a solar powered pump to fill the ponds with fresh water during daylight hours and an overflow standpipe drain to ensure constant movement of fresh water. A processing facility construction was finished in 2015 outside of the fenced breeding pond enclosure at the HCRC. The facility consists of a 16’x12’ raised wooden platform with a zinc roof with sky lights for better lighting and a custom built table for housing turtles during health assessments. Juvenile hicatee turtles are weighed and measured on a weekly basis to chart growth. Captive-breeding offers the potential to produce offspring for release and repatriation into areas that have experienced widespread declines or extirpation. Additionally, specimens maintained in captivity provide valuable opportunities for studying aspects of the species’ reproductive biology, diet and behavior that would otherwise be difficult to observe or study in the field. This information in turn, can help further inform and influence conservation strategies and actions. Research and activities at the HCRC combined with partner efforts will contribute to a comprehensive conservation and recovery effort for D. mawii in Belize. BFREE hosts high school and college student groups from Belize, the US and Canada. 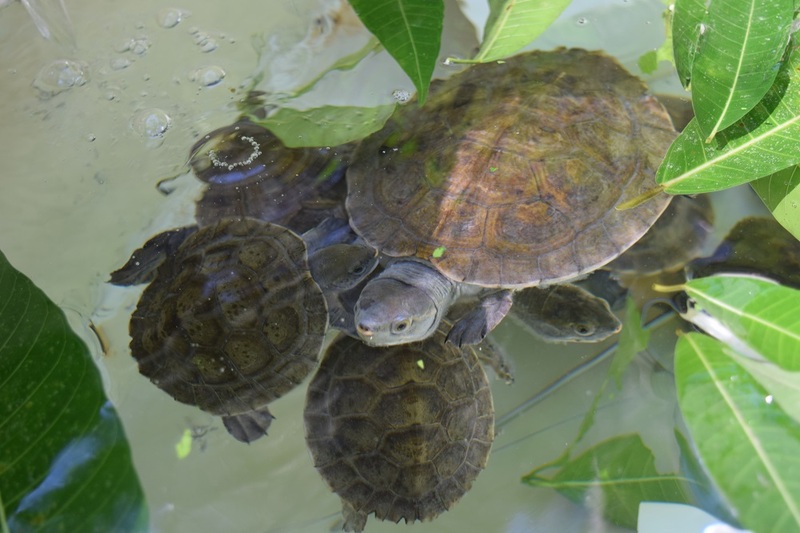 Beginning in 2015, HCRC staff began offering one hour tours of the facility combined with educational talks describing the current status of the Hicatee turtle in Belize and throughout its limited range. Researchers and other visitors to BFREE are also offered these tours upon request. Recent visitors to the HCRC have participated in the national #SaveTheHicatee awareness campaign by signing a petition banner thereby pledging their commitment to the conservation of the species. Sacred Heart Junior College students signed the pledge in April 2017. October is Hicatee Awareness Month! October 2017 marked the first ever Hicatee Awareness Month! We built The Hicatee Toolkit to include several turtley awesome opportunities for anyone to participate in the activities and events planned during the month of October. Don’t forget to shell-ebrate National Hicatee Day this October 17!